This easy-to-crochet bracelet features a crocheted toggle clasp and diamond motifs–all made in one go! Made with crochet thread, you can make this in an array of colors to make quick gifts for loved ones. Note: this bracelet is made all in one piece, so do not finish off after each piece. Repeat instructions for Second Diamond 8 more times, for a total of 10 diamonds. Ch 5, (sc in blo of 2nd ch from hook, sc in blo of next 2 ch), ch 4, repeat from ( to ) 1 more time, sl st around the toggle clasp, finish off and weave in ends. Enjoy your bracelet! If you need any help, just leave a message below and I’ll get back to you when I can. This entry was posted on Wednesday, July 20th, 2011 at 11:38 AM by Claire Ortega-Reyes	and is filed under Free Crochet Patterns. You can follow any responses to this entry through the RSS 2.0 feed. You can leave a response, or trackback from your own site. Can you make these in any colour? For those who like bling, this can be made using metallic crochet threads also. This is really neat. 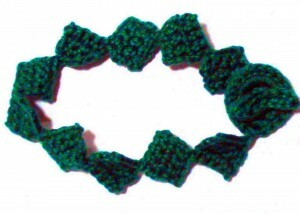 I’ve never seen a crocheted bracelet like this. Thanks for sharing the pattern Claire! This can be a simple and cute accessory for little ones. My nieces loved their bracelets made of white worsted yarn 🙂 Thanks Claire. I just finished this bracelet in a varigated blue thread. I love it! Thank you for sharing this pattern.